Achieve truly amazing results when concealing skin imperfections, blemishes, tattoos, rosacea, vitilgo and acne scars. Skin Camouflage is fragrance free, waterproof and smudge resistant. The colourperfect concealers are easily blended to match your skin tone for a smooth, opaque and near invisible finish. On the included DVD, Elizabeth Allen, BASC Certified Make-Up Artist, from the British Association of Skin Camouflage guides you through how to achieve best results. Smooth, long lasting near invisible coverage. Professional corrective cosmetic make-up technically advised by the British Association of Skin Camouflage (BASC). Conceals most skin blemishes including: Birthmarks, Tattoos, Vitiligo, Rosacea, Veins and Acne Scars. Water Proof, Smudge Resistant and Fragrance Free. Includes red and yellow base pigmented creams that blend to easily match virtually all skin tones for a natural looking finish. Comes with step-by-step DVD and instructional booklet showing camouflage tips and techniques. Includes three blendable concealers with a base colour. 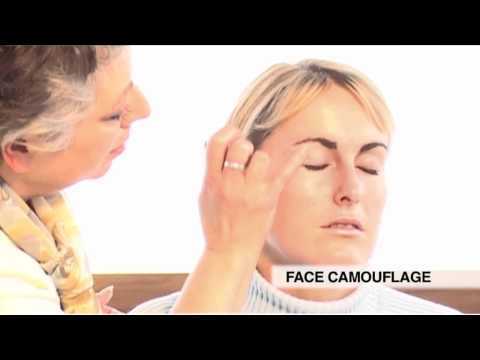 The included step-by-step DVD features Elizabeth Allen, BASC Certified Make-Up Artist, from the British Association of Skin Camouflage, to guide you through how to achieve the best results for your blemish and skin tone. With the exception of tattoos, it is always best to seek your doctor’s permission to proceed with Skin Camouflage, as you might, without realising it, be concealing a condition that requires medical attention. Should you notice any changes in your skin, and in particular any change to the colour or size of a mole, you must contact your doctor for a clinical diagnosis and you must stop using the Skin Camouflage until your medical practitioner has given you permission to continue. Full instructions and step-by-step DVD.